Every night, I go into my children's room and kiss their soundly sleeping heads. Every morning, I roll my eyes as they start to fight and yell at each other (our typical wake-up routine), but during all that, I'm usually blown away by a new word or four. Their pronunciation and diction are clearer, they're neurotypically developing, they're perfect. But what if they couldn't sleep at night? What if they couldn't speak much? What if sensory or other issues kept them from developing like they do each day? They'd be absolutely perfect children made even stronger by the struggles they'd have to face starting from such a young age. 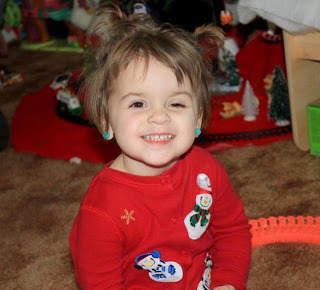 Maybe they'd be a little like Ky, a perfect little girl with a big heart who simply needs a little help. At two and a half, Kyra is struggling through Autism, Seizure disorder, and Marcus Gunn Jaw Wink. She laughs and loves and lives just like all other kids, but she has trouble with sensations, fears, sleep, vocalization. If Ky could get a little boost, her life would be so markedly improved that her mother has started a donation site to help Kyra attain a service dog. You might think...service dog? For Autism? No thanks. But don't let your pre-conceived notions close your heart. A service dog helps children going through what Kyra goes through daily by providing safety and distraction to them. Her mother feels a service dog would help disrupt the pattern of destructive behavior by distraction. Petting and loving it would stand in for self-harming and other ways children cope with out-of-control emotions. She also thinks it will help with Kyra's speech, training her to receive information through words and reply in kind. The dog will act as a barrier between Kyra and others, making her less fearful to go out, and making interactions less stressful to her. Right now, Ky is scared to leave the house, and melts down when taken on the simplest errands. Ky's mom also thinks the dog will be a huge benefit in the night hours. Right now, Kyra is unable to sleep. She has a weighted blanket and bear, and is even on medication to help, but the girl cannot sleep. A service dog would be with her during that time, lulling her, keeping her safe. Perhaps then, Ky could drift off. I cannot imagine having to exist with such limited sleep as this poor child gets. So, service dogs are not just for certain types of disabilities. They can help in ways we never even think of. So many children have so much to offer the world and need just a little help to start on their journey. If you're interested in helping Kyra start on hers, please take a look at her mother's site, which goes into greater detail than I could here. Children are perfect. They deserve our help and love. In the event you go through hedgehog crate assessment, you will find many types of hutches and also the most suitable dog could be selected according to your requirements. kbmdc the case is taken care of properly, the actual hedgehog will not have problems with bacteria there'll not be threat in order to skin ailment as well as respiratory system conditions.